Still catching up with photos that i have been aiming to post for a while! 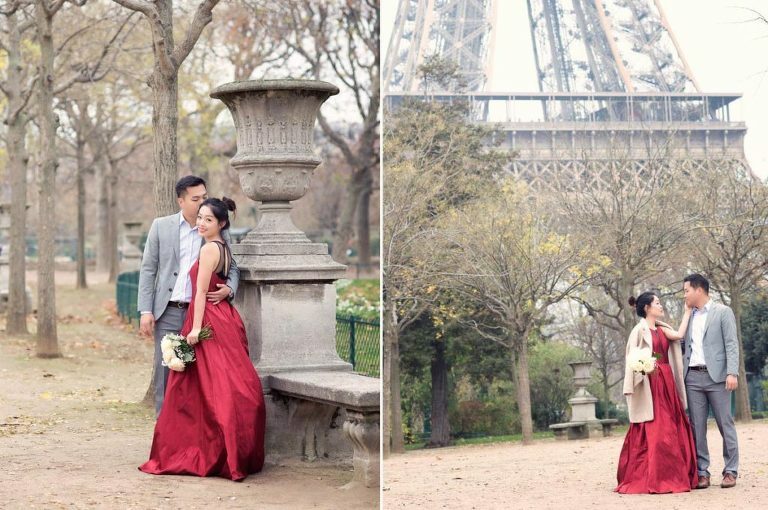 There is no season for engagement photography in Paris. The city is gorgeous all year long & a couple in love is never out of season! 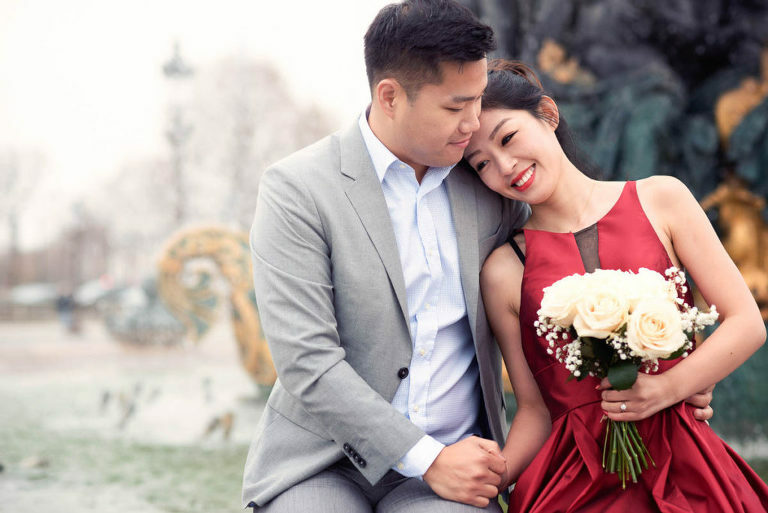 Wen and Matt contacted me to photograph their love in the most charming city in the world! Paris YEP, my dream town. I often photograph couples who wish to take the opportunity of being in town for a few days to have a photo session with a professional photographer. There are no rules & regulations in portrait photography when it comes to photographing the special bound that unite a man and a woman. 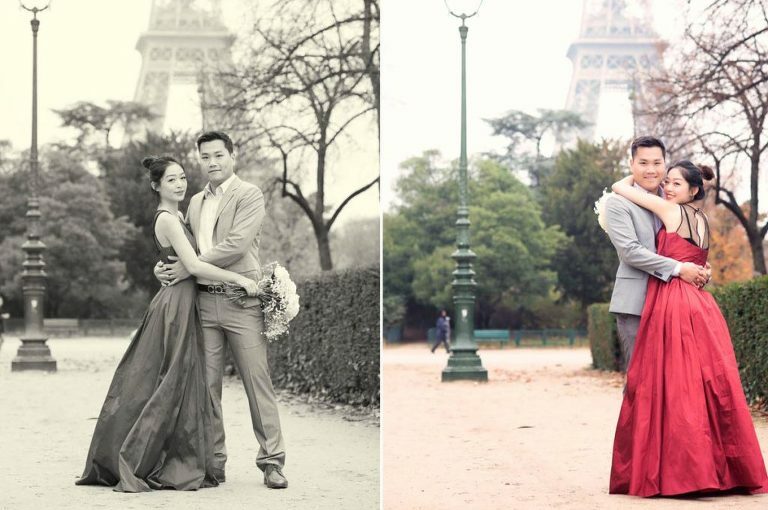 Of course, you want to see the Eiffel tower in some of the photographs. You want to see the beauty of the city in the background; some of the landmarks such as the Louvre, the champ Elysées, the Seine, and more of the Eiffel tower which is such an iconic, majestuous monument of our beautiful city. Most important, you want to be able to catch the joy and happiness that our couple experience while hanging out in one of the most amazing city on earth. I have different packages available to you, mainly depending on the number of hours you wish to book me for. My packages start at one hour at the Trocadero usually so that we do have the eiffel tower in the background ( although you may want to go a different route ). Wen and Matt had two hours of photography. Within that time, we covered the Eiffel tower from the champ de Mars, then went on to the Bir Hackeim bridge for a few more Eiffel tower shots with a different perspective. We then rushed to the place de la Concorde and the Tuilerie garden for the second part of the shoot. With my photography in general and specially for engagement shoots, I like to make sure that I catch both the joy of my couples and the beauty of the city in the background. I try to convey the emotion and the romance of the afternoon while I take my engagement photographs. It is a playful moment to have your portraits taken in Paris, a special time that you will cherish for the years to come. It is often the first time crossing over continents for some of you. I photographed Australians a few days back who have never been to Europe before. They will settle in their professional life once they return and may not come back for a while. Your engagement portraits are all very important. I put great care in the process to make sure that you will have a wonderful time with your photographer. Engagement photography is not just a set of posed photographs like I often see being mecanically performed at the Trocadero. My Paris engagement photography is lively and fun. I catch the heart, the soul and personality of two loving human beings in one of the most amazing city on earth! What a treat for everyone, photographer including so much so that I often get carried away in overtime!